There is constantly water around the base of my AquaComfort heat pump. Does this indicate a pool water leak inside my heater? No, this does not mean you have a pool water leak. Pool heat pumps are capable of producing up to three gallons of condensation an hour. A very simple way to test this is put a chlorine test strip in the water around the heat pump. Condensation will not have any chlorine in it; if it is pool water your test will show a positive chlorine reading. 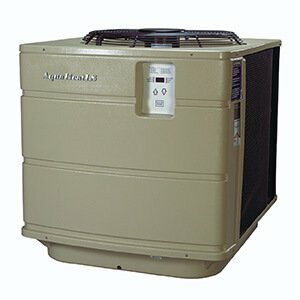 Should I cover my AquaComfort heat pump in the winter time? No, your AquaComfort heat pump was designed to be outside. Covering the heat pump will only make a warm, dry place for animals looking for a home. If you feel that falling tree limbs are a direct threat, you can cover the fan grate only. My AquaComfort heat pump display reads LPS when temperatures outside are colder ( around 40 degrees ambient air temperature). In my manual it states that LPS can mean I have a refrigerant leak. Do I need service? This does not mean you need service. 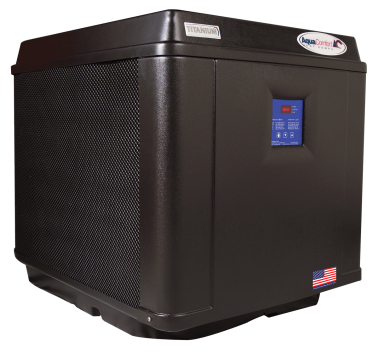 An AquaComfort’s heat pump LPS switch will turn the heater off and show a code of LPS when temperatures fall to around 40 degrees ambient air temperature or lower. This does not indicate a leak. This indicates that the outside air temperature has become too low for the heater to run. The heater will come back on when the outside air temperature warms up. I see a FLO code on my heater at times and at other times I don’t. Is this an intermittent problem? In most cases an intermittent FLO code is caused by your filter pump being turned on and off by the filter pump timer. The FLO code is indicating that the filter pump has stopped the flow of water to your heat pump. The heat pump cannot heat without water flow so it will turn itself off until the filter pump timer turns back on giving the heat pump the water flow it needs. If my heat pump shows an Error code on the display does this mean that my heat pump is being damaged? No, the sensors and computer control board that operate and monitor the various systems on the heat pump are designed to protect the heater by turning it off and displaying the appropriate error code; therefore eliminating the potential for damage. My heat pump is accumulating frost on the evaporator coil when ambient air temperatures are cooler outside. Is this a problem? When the ambient air temperature gets cooler it can cause the condensation to freeze on the evaporator coil. The heater has a defrost cycle that will initiate and melt the ice from the coil. The defrost cycle often takes little time to defrost the coil which means you may not always see it happen. Does setting the temperature on my heat pump higher than the temperature I am trying to achieve make the pool water heat faster? No, setting the desired pool water temperature higher than the temperature you are trying to achieve will only make the heater run longer until it reaches the temperature it is set for. When the ambient air outside is colder, it seems as if my heater does not heat as fast. Is this normal? Yes, there are two major factors that affect the ability to heat a pool. One is how much heat you’re able to put in the pool. When the ambient air temperature gets colder there is less free heat available for the heater to transfer into the pool water. When it’s colder, allow your heat pump to run as long as it needs to achieve the temperature you desire. You may need to adjust the filter pump clock to run longer so the heat pump does not shut itself off as a result of no water flow. The second is how much heat you’re able to retain in your pool. The greatest cause of heat loss from a pool is ambient air temperatures colder than your pool water removing the heat from the pool. You may want to invest in a solar cover. A solar pool cover will insulate the surface of your pool greatly reducing the amount of heat loss. This will also save you money. How do I winterize my pool heat pump? We highly recommend that you have a Pool professional winterize your pool equipment and heat pump. Any Freeze Damage that occurs from a homeowner winterizing their own heat pump is NOT covered under warranty and will void the warranty of the heat pump. To winterize your heat pump you need to turn off the power at the electrical panel (breaker). You MUST ensure that you have drained all of the water from the heater. Water left in the heater will freeze causing significant damage to your heat pump. The plumbing must be left in such a way that it will not collect any water or be accessible to animals over the winter. If you are not confident that you are able to achieve any of the above guidelines please seek help from your qualified pool care professional. Not for your pool dealer. An AquaComfort heater can be installed by your pool professional quickly and easily. Does AquaComfort require a GFI breaker to protect the heat pump circuit? No, AquaComfort does not require a GFI to protect the heat pump circuit. Does my heat pump need a fireman’s switch? No, a fireman’s switch is only needed for combustion source heating equipment. Can I install my heat pump indoors? No, AquaComfort heat pumps work by absorbing the heat from the surrounding air and exhausting the colder air out of the top of the heat pump. If our heat pump were installed inside of a building the Heat pump would absorb the heat from that space and exhaust the colder air into that space which would cool down that space until the unit could no longer operate. My electrical Installer would like to see the electrical specifications of the AquaComfort heat pump I have purchased, where can I find this information? All of AquaComfort’s heat pumps have what is called a data plate on the front panel to the left of the display. This data plate indicates all of the mechanical and electrical specifications necessary for installation and service. However, if you or your electrician would like to view these specifications then please click here. Where can I find an owner’s manual for my heat pump? 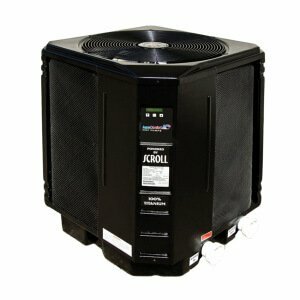 Visit our Service & Support page and select your heater model. How can I locate my heat pump’s model and serial number? 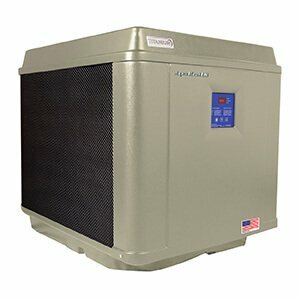 How do I request service for my AquaComfort heat pump? You can submit a service request directly on our website. 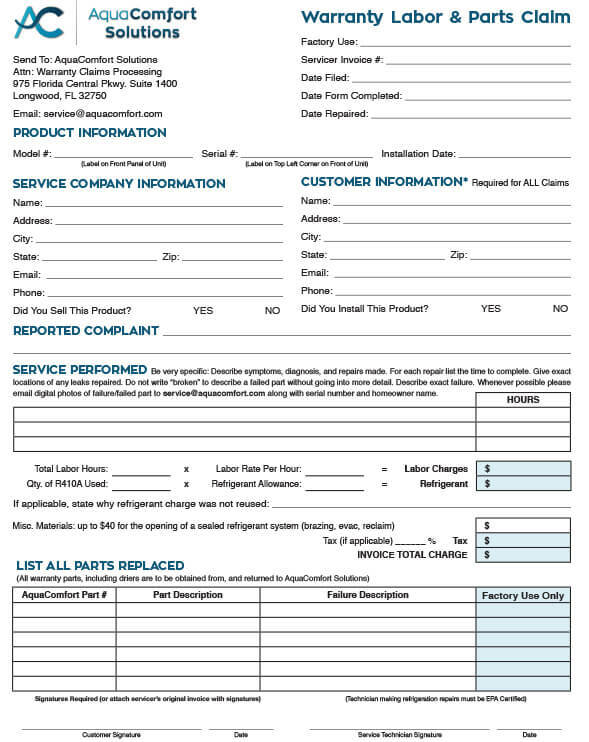 Visit our Service Request page and complete the online form. How can I complete the warranty registration for my heater? You can register your product directly on our website by filling out the form on our Warranty Registration page.